Welp! She finally arrived! A new to me SIG 1/6th Scale J3. It boasts a 72” wingspan, and the plans say copyright 1971 I would believe it if you told me this kit was originally purchased in 1972! I didn’t have an idea of the completeness of the Kit when I bought it and truthfully I still don’t. 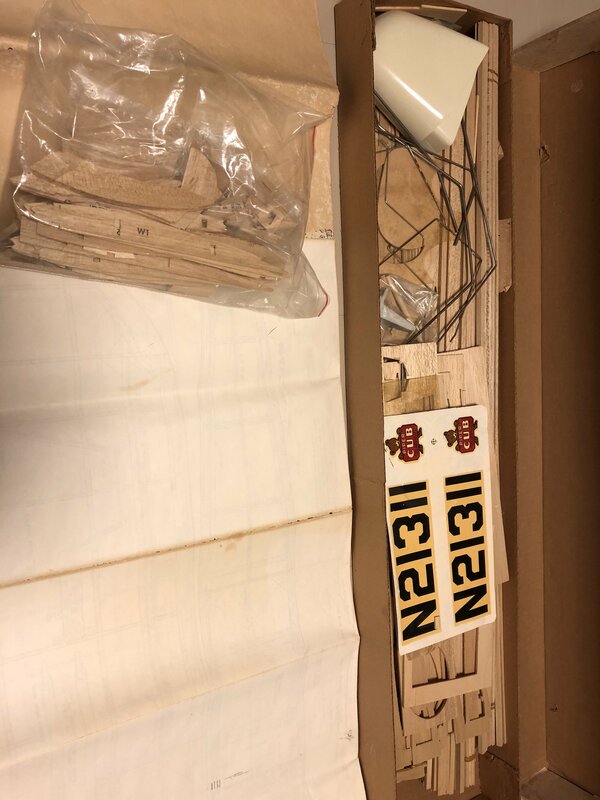 I picked it up in an eBay auction that listed it as NIB however it came somewhat broken into nothing assembled but rib parts have been removed from the Die Cut Balsa and the plans have been un rolled and subsequently folded. I don’t know if anyone out there has a set of extra plans these ones have certainly seen better days! I do have access to a large format printer so I may try to get ahold of a digital copy that I can print out at work. Here are a few Pictures to kick off the build! I don’t know what the official start date is so this is mainly just an inventory. 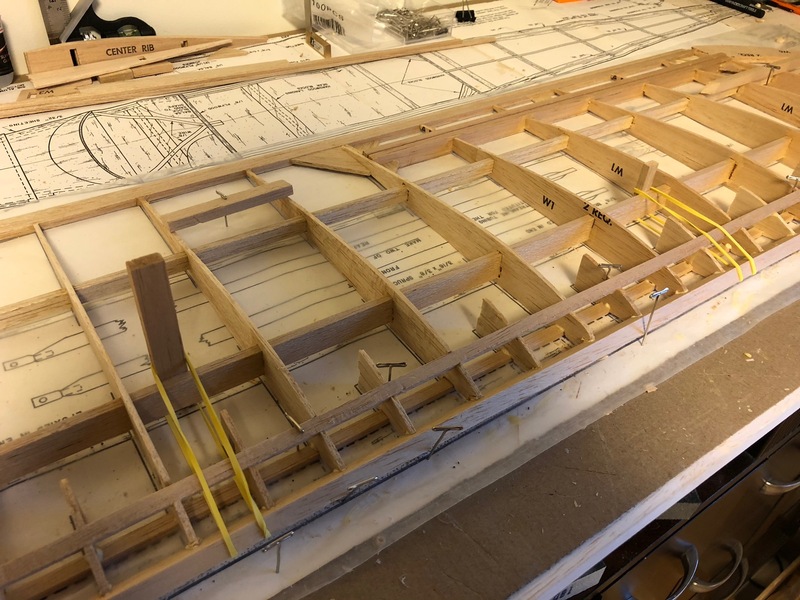 It appears at least that most of the wing is complete, the Rudder and elevator do not look to be cut out of the balsa sheets yet, so it appears that I will be starting on the wing! There are a few center section runs that look to be damaged but there are enough full ribs that I can easily cut new ones! Still an inventory, just trying to get an idea of what I will need to fabricate. The wood for the spars seem to be warped slightly I may get new balsa for these sections. Not sure what electronics are going into it, building especially this size is new to me, so if anyone has motor recommendations I’m all ears. I’m currently leaning towards gas at this point but I’m all open to electric as well! So the major thing it was lacking is the Builders Manual which I was able to find online I’m still looking for a full size plan set, if anyone knows where I could find that I’d appreciate it. I am going to build a 1/4 scale Sig clipped wing cub in the future and am going to install an Eflight Power 160 in it. But I need the extra power because this will be a float plane. I think you can download the manual off of Sig's website. 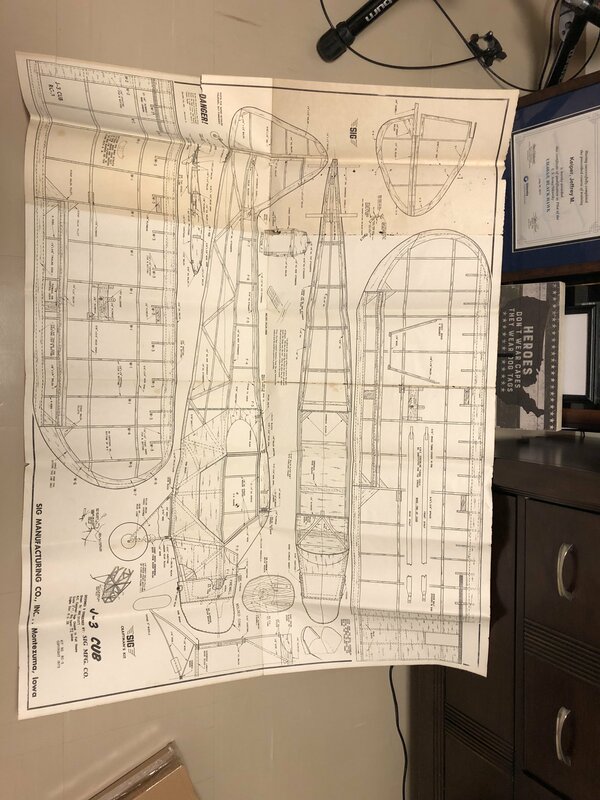 You are correct I have the builders manual, and you can buy the full size plan for 5.75 I combined it with some other things to cover shipping and should have them soon! I am not going to commit to gas or electric right now, we will see how the build goes. Not cutting the cowl up would be a huge plus but we will see how crafty I feel. Cleared out a spot in the guest bedroom, got an entire dresser and corner! More than I had hoped for honestly! 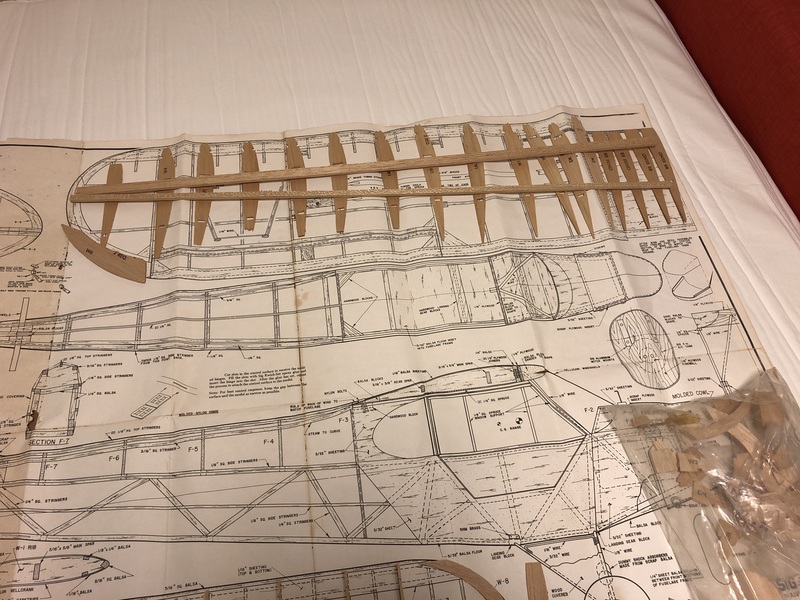 I don’t currently have a garage so this will do I’ve started sorting the balsa and identifying the wings a few of the ribs have broken in half so I went ahead and glued them back together, the ones I can’t find all the pieces too will be recut. So far I have all of the crucial right wing pieces and I couldn’t help but a glue a few of them together! A little good news, the full size plan sheet can be purchased from sig! I started glueing ribs today, this is a new process for me! I installed the spar and made sure the fit was loose without having to force the ribs on it. I found that rounding the corners of the spars just a little bit with the sandpaper made a huge difference in fit! I had previously broke a couple ribs in this fashion so I learned my lesson a bit late! 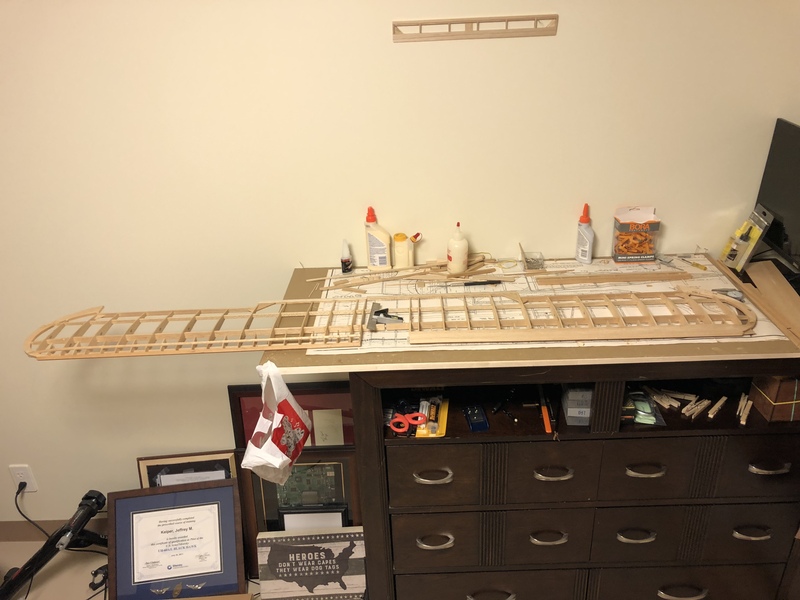 I got the first few ribs glued and most of the aileron, I need a couple stiffeners and the aileron will be pretty close to complete, at least for this wing, I’ll still need to add in some reinforcement for hinges depending on what I decide to go with. Looks great, I love a nice wing build! Yeah, there’s something really satisfying about watching the airfoil take shape!! 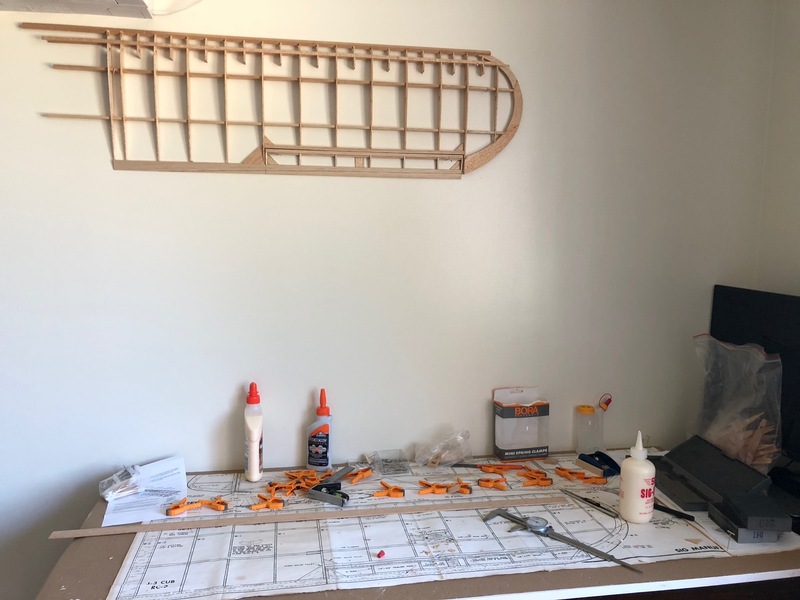 Well I hung the right wing up today to get the build started on the left side, theres a couple of things that still need to be finished but i dont want to finish them until i get the left side up to the same point. Because this wing will eventually be joined into one wing. I dont yet want to finish the leading edge sheeting so i can ensure that its symetrical. 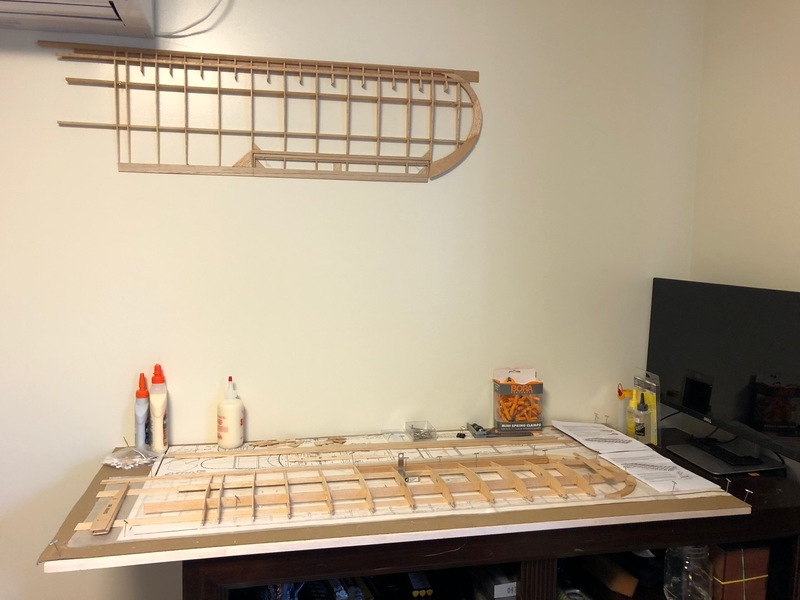 I also am contemplating building the center section into the fuselage so both wings can be detachable but i am not at a point where i can begin building in that direction so i dont want to spend more time finishing the wing only to find out i need access to something later. Since I am abandoning the bell crank in option of servos in each wing, i want to build a tray for them once the servos arrive i can begin that process. I am finding there are alot of things that need to be done that are not in the plans, or the build manual, such as holes for what would have been control rods that now need to be put in for servo wires. Theres also a couple of extra ribs that I believe were to be doubled up however it wasnt in the plans or the build manual so I need to figure that out as well. 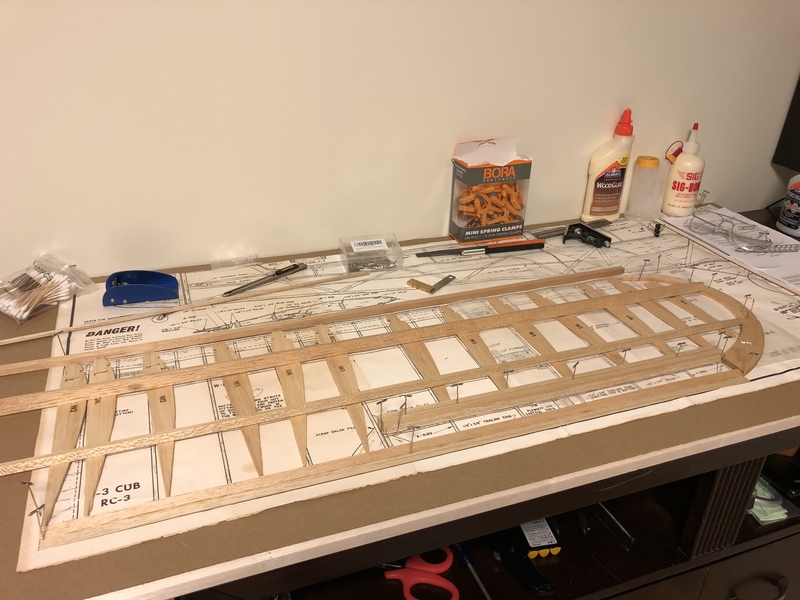 Today i started laying out the new wing, i had a couple of ribs that had broken and i glued those back together i had to make a new tail section to one rib so I cut it out like a puzzle piece to give the glue more surface area. not sure if this is a common technique but it seemed to stiffen the part up more than just gluing a straight joint ill probably continue to do this in the future. I only had to fabricate one new rib section. so that is a bonus. I went to my LHS in search of Balsa and came up short! Evidently its difficult to import Balsa to Japan. 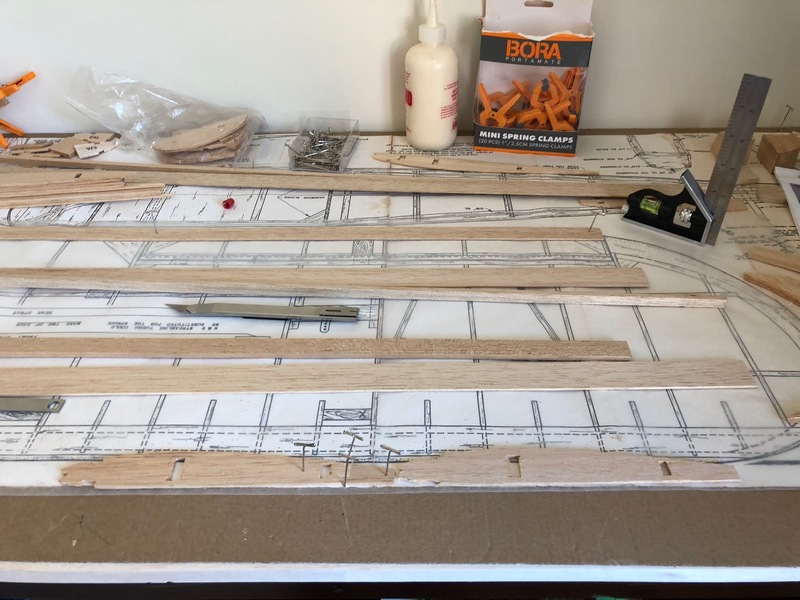 I am not sure of the reason, and my build surface is a huge 1/2" Thick butcher block of balsa(Unless it is a balsa-like wood) that I was able to purchase from the hardware store?? 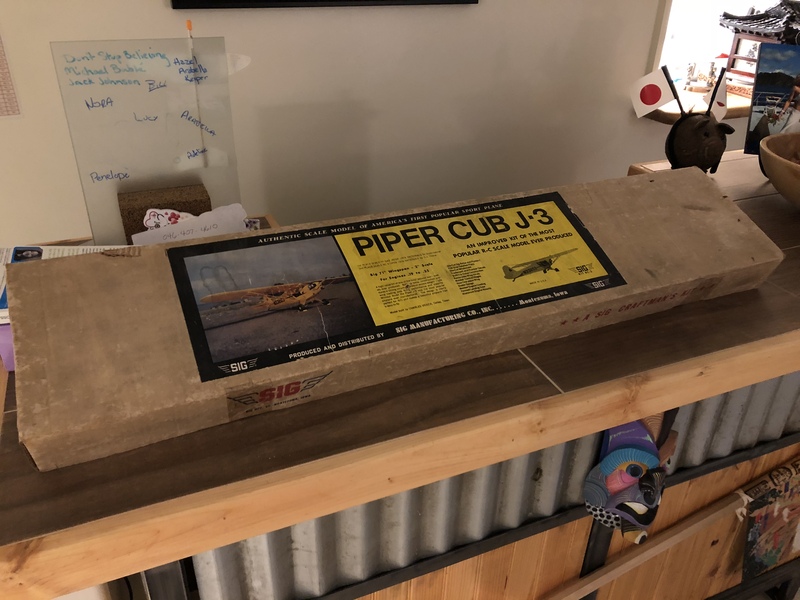 I have BIG plans for this cub, but it requires more balsa, much more balsa!! So until I can figure that out I won't spoil the surprise! So today I spent gluing up the left wing! I was able to get through all of the wing ribs and glued up the Aileron. While this was drying I made a trip to the Hobby Shop. That's when I noticed it..... I had three sizes of balsa stock and a single 5/16" Square stock. 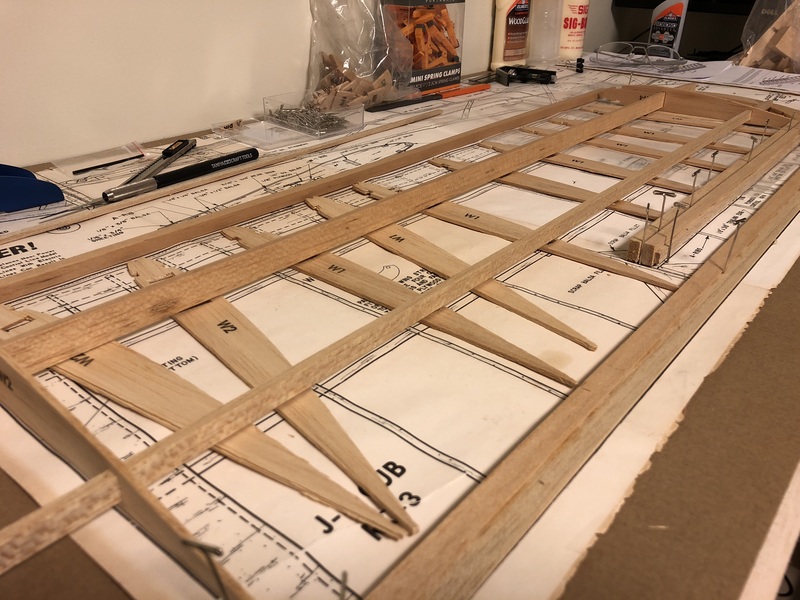 When I looked up at the wing on the wall I noticed it also had the 5/16" leading edge... and the leading edge I had just glued up I realized was 1/4"!!! I had glued in the wrong spar! 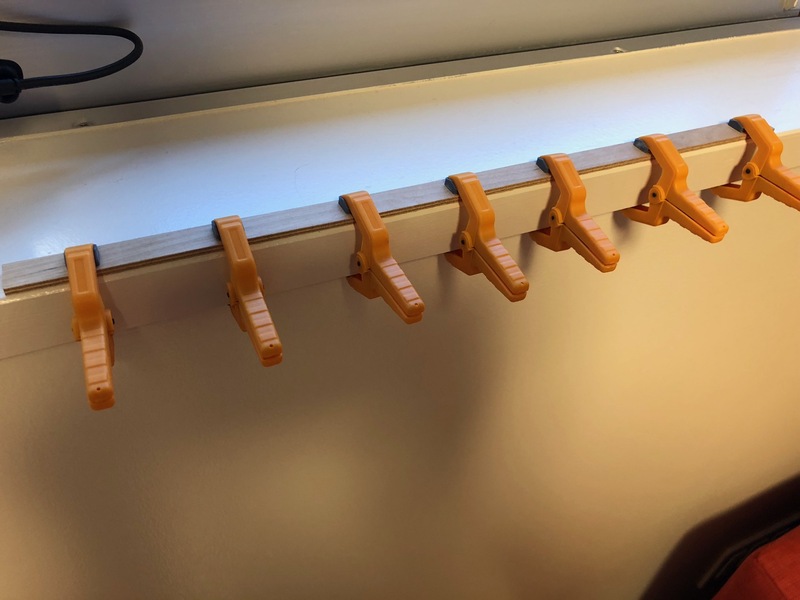 luckily it was the left wing I had just finished installing that was wrong, the glue hadn't set up completely and I was able to swap them out easily enough!! Last bit of drama for today was the Center Section Spar-Plywood one of the sections is bent pretty good, and I clamped the ply sections to see if it will laminate straight, but no such luck, I soaked it and clamped it to a flat surface to see if I can get some of the bend out. If I can't get the bend out I am going to laminate some carbon sheets and replace the plywood spars with carbon fiber. Also Props to Joker for the leading edge spar glue up tip. the rubber bands worked flawlessly. Glad the idea worked for you. I did notice that with thinner balsa sticks it can make the material bow a bit. My pic showed it on 3/4” material which resisted bending quite well. Glad the idea worked for you. I did notice that with thinner balsa sticks it can make the material now a bit. My pic showed it on 3/4” material which resisted bending quite well. 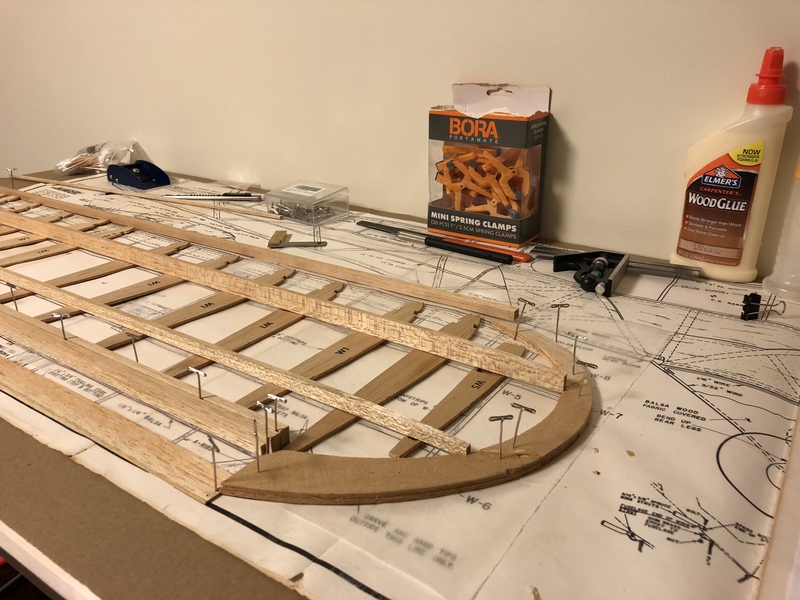 Yeup when I first glued in the 1/4 Balsa I thought it was too much pressure but when I installed the correct 5/16" spar I didn't have any issue with bending. I suppose you can use twine with the same effect and vary the pressure with a knot or use a different rubber band. But it worked well! So I’ve got quite a bit done, the left wing is almost complete, couldn’t help but mock it up. This is my first balsa build and there have been moments of; what did I get myself into?? 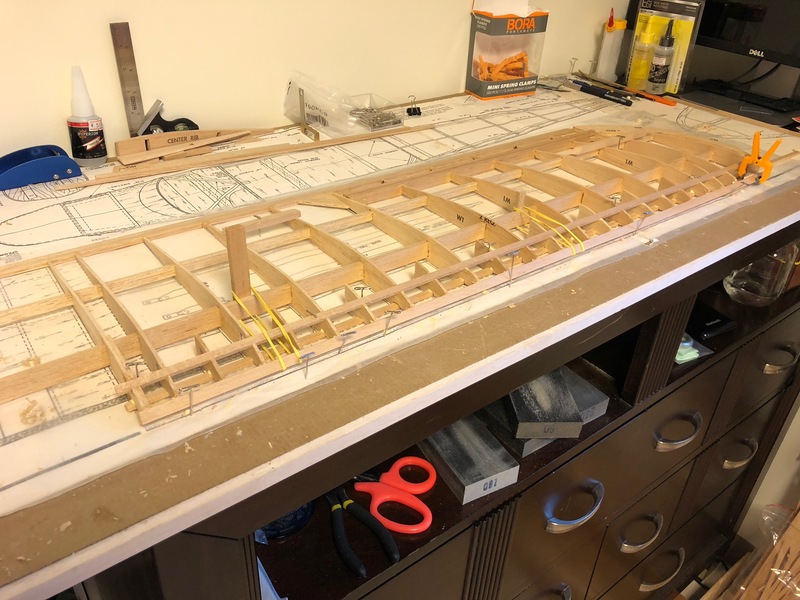 But there’s also something gratifying in seeing an airfoil you’ve built take shape the one thing I’ve decided is no matter what I’ll give it ten minutes and if I’m not feeling it I’ll walk away. But some days that Ten minutes turns into an hour and the progress is very rewarding. I agree with jokers assessment in choosing your first build, make it a build that YOU will be successful at. I’m confident in my abilities to finish this build, but I wouldn’t recommend it for someone as a first build. Either way go with your gut. Quick question for the “experts” (anyone who wants to chime in) the plans call for .75” dihedral measured near the tip, cub wings are almost perfectly flat so adding the match dihedral is definitely not scale. Question is should I add the dihedral, or build it flat like it would be scale. For Reference: The Balsa Building Board is 140 cm (~48 in) long. I agree with jokers assessment in choosing your first build, make it a build that YOU will be successful at. 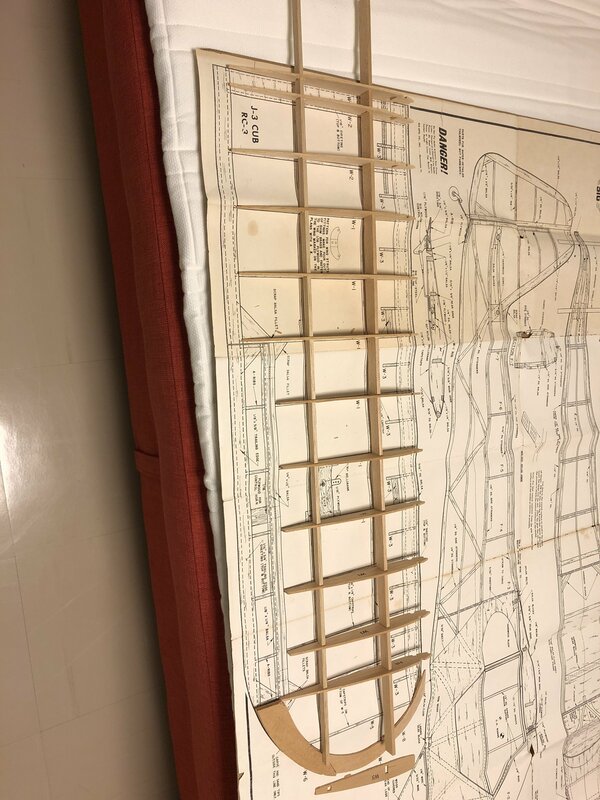 For Reference: The Balsa Building Board is 40cm (~48 in) long. First, that "joker" guy sounds brilliant with that advice. Regarding dihedral, going with a true flat wing will actually make the plane look like the wings are drooping a bit. 3/4" of dihedral probably won't change how it flies, but it'll certainly make the plane look better. I would absolutely do as the plans show for it. For the rudder you said "push pull", did you mean pull-pull? Push pull would be a regular pushrod setup, which would work fine for this plane. Either would work, but the pushrod setup would be easier to build. A lot of good advice! Actually the rubber band trick works for other areas to like leading edge sheeting! 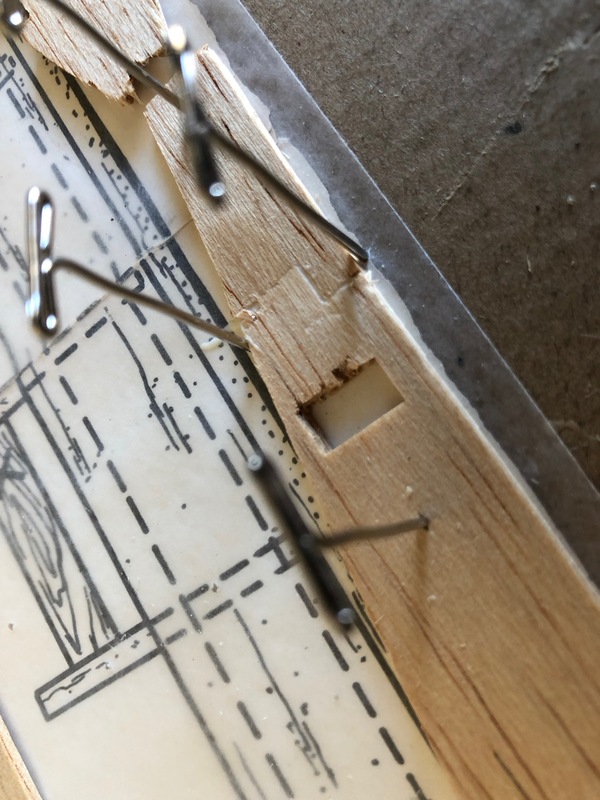 After you lay it up putting a dowel rod across the sheet and under the rubber bands helps to spread pressure across the wings and forms the sheet to the leading edge. Truthfully If I had read it before I bought the kit I may have done a different build. No regrets. Yes good catch, I am planning on a pull-pull setup. Floats may be in the future and I think it will lend to a better set up if I want to add a steerable rudder. Good Point on the dihedral my main concern is aesthetics so if adding dihedral helps .75” is not a lot. Still considering a two piece wing (permanently mounting the center section because I move a lot so smaller pieces tend to survive movers better. However the wing will still be fine if I build it according to plans. Thanks for the input definitely going with the plans. I do have a couple foamys to play around with, nothing this big though! 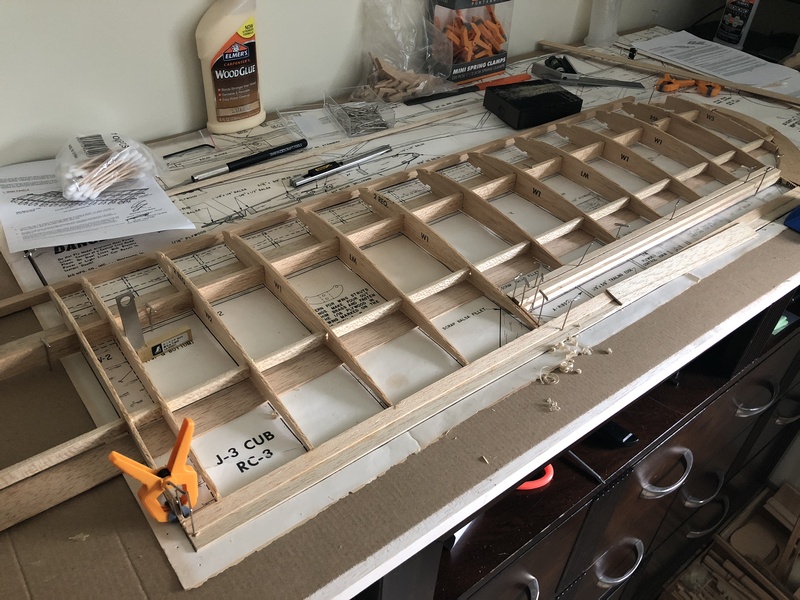 I don’t plan on flying off the floats anytime soon, but I fell into a 1/6th scale float kit, seeing as how I haven’t started the fuselage yet it seems like a good time to build in the extra support for the floats. Never gonna have this much access to the fuselage than now right!! ?